Your wedding dress is possibly the most expensive clothing item you will ever buy and like everything else in life if we want something that is going to bring back memories of a special and truly happy time then its up to you to make sure your dress is kept in as near perfect condition as the day when you first wore it. Imagine if after wearing your dress it was just hung up in the wardrobe or placed in a drawer! In time it would get pushed further back into a cupboard until it falls on the floor where it remains forgotten and gathering dust! After time, on finding your once beautiful dress that you searched for so long to find and made you feel like a princess on your wedding day is now crumbled, dusted and bedraggled. Can you imagine how you are going to feel? After your wedding and the honeymoon is over you will most probably get down to writing those thank you notes, unpack your wedding gifts and start back to work as a newly married woman. Why not add to your ‘priority list’ your wedding dress? Plan to get it dry cleaned as soon as possible ready to be stored away to retain its beauty and happy memories. Do not just pack up your dress without first having it dry cleaned. Your wedding dress will have been worn for a good few hours and chances are something could have been spilled on it, children’s hands will have been touching it and you may have been perspiring during the day. Ask one of your bridesmaids or a family member to get your dress to the cleaners while you are on your honeymoon. Any tabs that were on your dress and may have been removed should be given to the dry cleaners to help them ascertain how your dress is to be cleaned. Double check that the dry cleaners you entrust your dress to are specialists. Make sure that insurance is offered in the price of the dry cleaning and always check what their policy is if they damage or lose the dress. Go over the dress once it is back from the cleaners to make sure they have done the job properly. Some dry cleaners may pack the dress away for you in a wedding box and if this is the case, ask to be shown it before it is packed away. Some dry cleaning specialists will pick up and redeliver your dress for a small fee. Once collected from the dry cleaners, do not leave the dress in the plastic as over time the plastic can give off chemicals which will discolour the fabric. Take out any pins that are in the dress otherwise they will oxidise over time and leave rust marks on the dress. Do not leave your dress on a hanger long term as this will cause stress to the seams and shape of the dress. Plastic storage boxes are not really recommended by the specialists for long term storage as moisture can develop inside the box causing the fabric to develop mildew. Boxes specially designed for wedding dress storage are easily available. Do not try and cut corners by using a normal cardboard box! All cardboard (unless made with special pH neutral board) contains acid and in time it will ooze onto the fabric of your dress and cause it to discolour. Use acid free white tissue paper to help prevent yellowing of the dress if you are boxing it yourself. Normal coloured tissue paper will over time transfer the dye it contains to your dress. Never use black tissue! Make sure you are not storing your dress in an area that is prone to high humidity, such as the attic or the other extreme somewhere damp like the basement. Changes in temperature could well risk a higher increase in the deterioration of the dress. 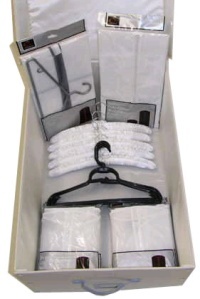 Best places to store the wedding box can often be in a wardrobe or under the bed. Do not store your dress in a room or area that has a known history of damp or insects! Unpack your dress at least once a year, every six months is even better. This will help to prevent creases becoming too permanent. Plus it gives you a chance to look over your dress and let those memories come rushing back of your wedding day! The cost of having your wedding dress can vary and the more expensive your dream dress, the higher the dry cleaning costs could be. Prices can be from £50 to £150 and always double check if and how much insurance the dry cleaners are offering. If they do not offer any insurance, chances are they are not specialist cleaners and it really is not worth using them. 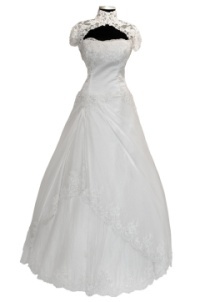 Most specialists offer at least up to 50% of the value of your dress and this will vary from shop to shop. If you do choose to go down the ‘bargain’ road to have your dress dry cleaned, just think how devastated you will be to find that the shop has either ruined or lost your dress and you have no insurance or guarantee from them to begin with. For the sake of a few pounds, after all the thousands you have probably paid out for your wedding day – don’t try and cut corners with something as wonderful as your dress!